Over 900 exhibitors offering everything for the country enthusiast and an anticipated attendance of over 140,000 people, Blenheim Palace was the place to be at the weekend. FishPal were there soaking up the atmosphere within the newly designed World of Fishing meeting customers and talking about all things fishing. First impressions set the tone. The new, compact fishing area with casting pool and rod testing area at centre stage, gave it a festival feel. 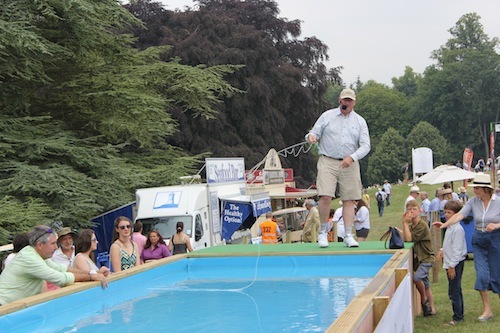 Back to back demonstrations during the day from manufacturers and specialists from across the globe offered something for all fishing genres, salmon, trout, lure, predator and bass fishing to name but a few. Ian Gordon, Hardy consultant, gave a captivating demonstration on the double handed rod. It’s great to meet existing customers and also to be introduced to new customers wanting to go fishing. Popular rivers again at the CLA were the Spey, Tay, Tweed, Tyne, Test, Itchen and Ireland’s Blackwater. It’s always super to hear from anglers saying that our site can be rather “addictive” in particular the following pages – Latest Catches, River Levels, Availability, Reports. The new FishPal Malloch Trophy and international fishing site with our partners Sportquest also received lots of positive feedback. The CLA is a welcome opportunity for ourselves at FishPal to find out what our customers enjoy about our sites and also a chance to promote new pages and sections, including reminding customers that we have everything for a successful fishing trip, from accommodation, tackle shops and advice to booking a casting lesson or guide. The Angling Trust stand positioned at the heart of the village welcomed MP George Eustice, Minster for Fisheries and newly installed Defra Secretary Liz Truss who also tried her hand at fishing with angling coach Sam Edwards. It was lovely to see retired Angling Trust Chairman Mike Heylin and offer our congratulations for the OBE awarded to him in the Queens Birthday Honours list for services to sport. 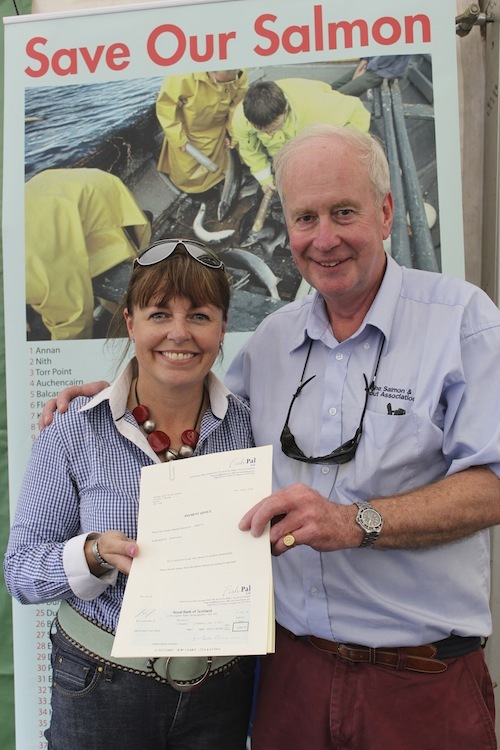 FishPal handed over a cheque again at this years CLA for just over £2986 to S&TA Chief Executive, Paul Knight. The second of two cheques for the charity so far this year. Nearly £5,000 has been donated by anglers when booking a days fishing on the FishPal website. This money will go to continue the great work of the S&TA. The rest of the show ground was split into sections offering ease of access to enjoy your favourite country sport. We were spoilt for choice on Gun makers Row. It was great to catch up with Roxtons within the Holland and Holland stand. The Loughs Agency. Hunter, Savills and many more. This year Lyndsey Farmiloe, Lower Itchen Fishery, was exhibiting with her team within the Lairds Sporting Directory stand. A busy 3 days for Lyndsey with enquiries from anglers wishing to book fishing for salmon, trout and grayling. With so many people to meet, spread across a site that has grown from 8,500 visitors in 1958 to one now catering for 900 exhibitors and approx 145,000 visitors in 2014 – it was always going to be a challenging few days.